Stick all of those things in a food processor and whiz around until it is smooth. Add more water for a thinner humus. 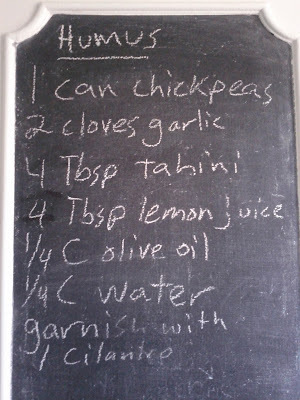 I added a half teaspoon of cumin but didn't write it on the big board. Serve in a bowl garnished with chopped cilantro, a drizzle of olive oil and a crack of black pepper. Scoop with pita. 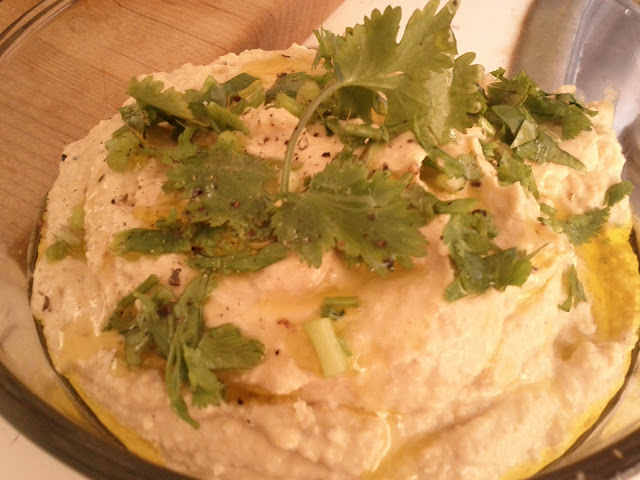 Tahini is really important for good humus, don't bother with poor substitutes. This hummus is the closest to store bought I've made so far, and better than almost every other homemade humus I've tried. The lemon juice balances the richness of the olive oil and tahini nicely. With this dish, a little garlic goes a long way, especially the next day. Not bad for five minutes work. Sam! I didn't know you had a food blog! This is awesome. We need to collaborate.